KOBE will soon be 18 years and he still maintains an impressive presence. 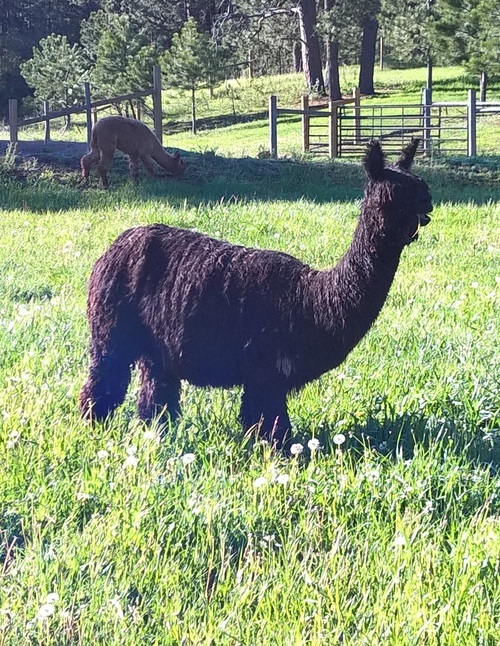 KOBE is a rare alpaca who truly takes your breath away with his lustrous, jet black, tight locks, exact conformation, and signature Suri head. 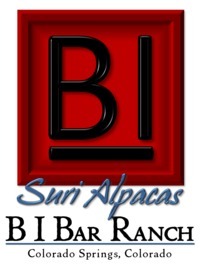 Add to this his proud presence and poise and you have an outstanding alpaca who is recognized as an icon among Suri herdsires in the North American herd. It is extremely rare that an animal has the ability to establish a supreme position in any livestock industry. KOBE is just such an animal. He was born out of Champion, Get of Sire and Produce of Dam winners, PVA Mahogany Prince and BBF Azalea. Each of whom continued to produce exceptional champions. 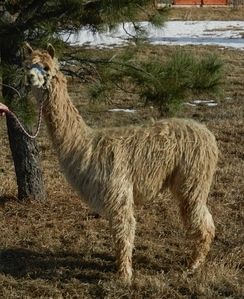 Kobe is a rare treasure of the North American Suri herd. Until now, Kobe has been closed to outside breedings. 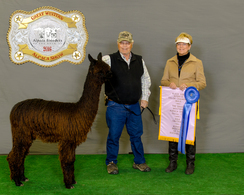 KOBE has had an outstanding show career as Supreme Champion, IAO, twice Best Head at IAO, Champion AOBA Nationals, Champion at Futurity and Champion at CABA and AWE. 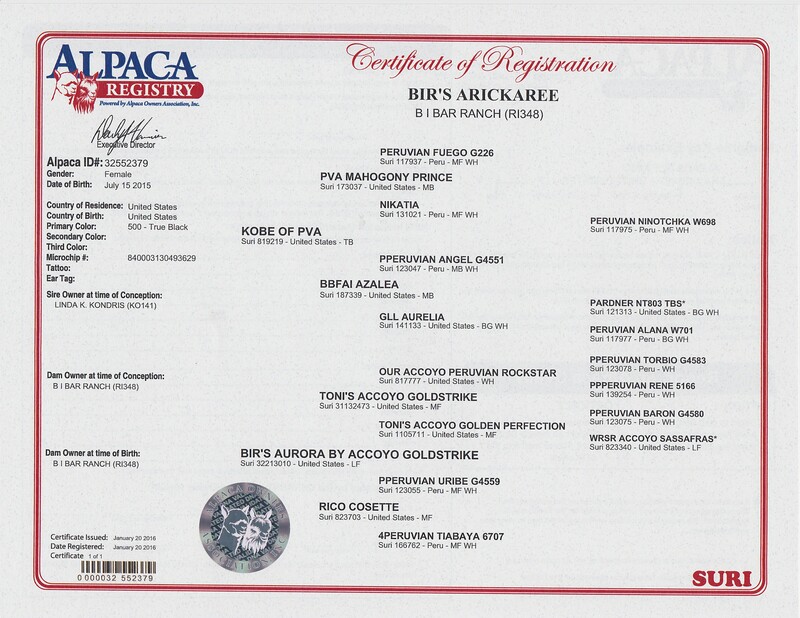 He has multiple Get of Sire awards and many champion offspring such as ten time Champion Diamonte of PVA. After a stellar show career, KOBE has gone on to produce phenomenal offspring with optimal health and reproductive capabilities. He began settling females at just 19 months of age with over 120 offspring, 50 per cent black, and champion after champion. Looking for color? Only four of KOBE's offspring are white! His genetics are highly sought after and his famous son, Diamonte of PVA, sold for $195,000! 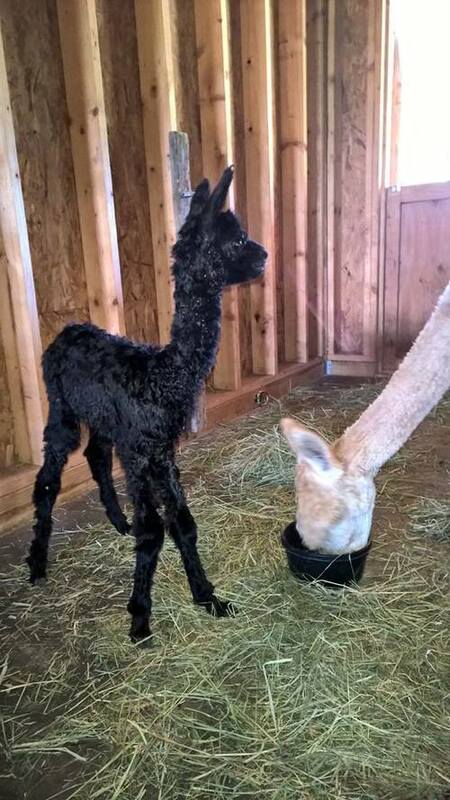 Kobe was closed to outside breedings at Park View Alpacas. We did a biopsy of Kobe at 14 years of age. Would you believe he had a micron variation of just 6.4 with the spread a very fine 24.7-31.1. Also, 4/4 glands maintaing great luster. 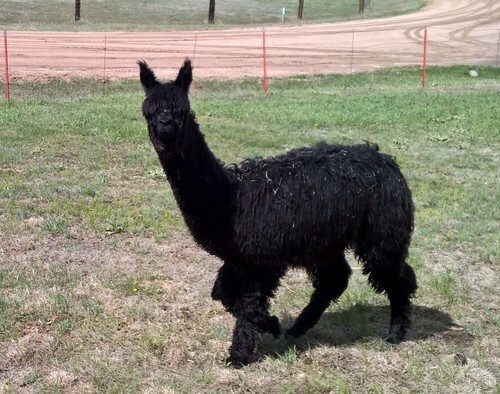 KOBE now stands in Colorado and is co-owned with Bijou Alpaca Ranch.